After his untimely death, we look back at career milestones. 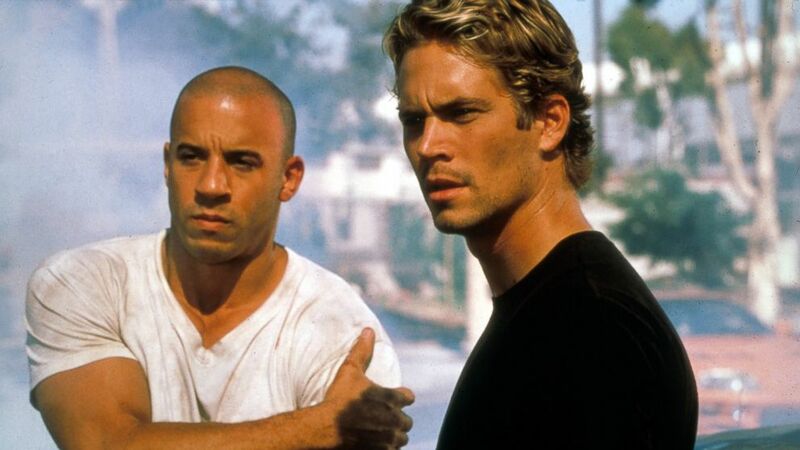 intro: Paul Walker never won an Oscar, but he sure made an impact on the big screen. The 40-year-old "Fast & Furious" star died yesterday in Los Angeles in a car crash, cutting short a career that spanned more than 20 years. From his early 1990's appearances on "Who's the Boss?" and "Chares in Charge" to his breakout roles, including "Varsity Blues" and six "Fast & Furious" films, Walker was a bankable Hollywood star. Yesterday, Universal Pictures - the studio behind "Fast & Furious" - released a statement saying, "All of us at Universal are heartbroken. Paul was truly one of the most beloved and respected members of our studio family for 14 years, and this loss is devastating to us, to everyone involved with the 'Fast and Furious' films, and to countless fans." Here's a look back at Walker's most memorable movie roles. title: "Pleasantville" - 1998 text: Opposite eventual Academy Award winner, Reese Witherspoon, Walker played Skip Martin, Witherspoon's love interest. In a movie about a brother and sister from the 1990's transported into a 1950's clean-cut television show, Walker was a standout. It was one of his first big screen roles and immediately had movie fans asking, "Who is that guy?" quicklist: 2 title: "Varsity Blues" and "She's All That" - 1999 text: 1999 was a big year for Walker. In what was supposed to be James Van Der Beek's breakout role in "Varsity Blues," Walker stole the spotlight as the polite, yet injured star quarterback Lance Harbor. His blonde locks and blue eyes had fans swooning over his character and on-screen Texas charm. Then, Walker cemented his burgeoning role as a heartthrob in "She's All That" as the cocky Dean Sampson, who tries to steal away his best friend's girl to win a bet. Even though he played a bad guy on screen, you knew you were going to see this young actor again and again in starring roles. quicklist: 3 title: "The Fast and the Furious" - 2001 text: This was the movie that changed it all for Walker. In "The Fast and the Furious," the first of seven movies from the series to date, Walker played Brian O'Conner, an undercover detective trying to infiltrate and take down a ring of street-racing thieves, but ends up befriending the group's leader Vin Diesel and falling for Diesel's on-screen sister. title: "Into the Blue" - 2005 text: This movie had Walker opposite Jessica Alba and wasn't hard to watch if you were a fan of either. The plot centered on a group of divers, who come across some dangerous cargo, but it was more Walker showing off his rock-hard abs and Alba often in a bikini that made this a must-see. title: "Takers" - 2010 text: After filming a heart-warming movie "Eight Below" in 2006, and another "Fast & Furious" movie in 2009, Walker joined a star-studded cast in "Takers." Playing John Rahway, Walker and Idris Elba led a gang of confident bank robbers, including Hayden Christensen, Michael Ealy, T. I. and Chris Brown. title: "Fast & Furious 7" - 2014? text: In a movie that was still filming, Walker tweeted on Nov. 29, saying "The boys are back. Will you be ready? - #TeamPW #FastFridays," alongside a pic of him, Diesel and Tyrese Gibson. IMDB has Jason Statham, The Rock, Walker, Diesel and Kurt Russell listed to come on board for the latest installment and the release date set at next summer. If the movie moves forward and his footage is included, it will be Walker's last and a fitting way to close his illustrious career.